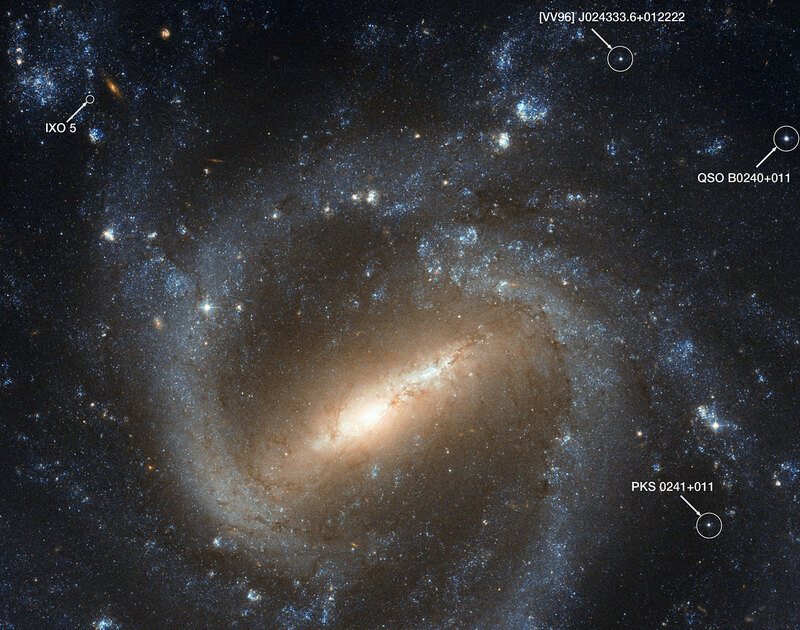 While Hubble’s image of NGC 1073 is in some respects an archetypal portrait of a barred spiral, there are a couple of quirks worth pointing out. One, ironically, is almost — but not quite — invisible to optical telescopes like Hubble. In the upper left part of the image, a rough ring-like structure of recent star formation hides a bright source of X-rays. Called IXO 5, this X-ray source is likely to be a binary system featuring a black hole and a star orbiting each other. 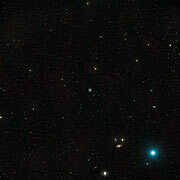 Comparing X-ray observations from the Chandra spacecraft with this Hubble image, astronomers have narrowed the position of IXO 5 down to one of two faint stars visible here. However, X-ray observations with current instruments are not precise enough to conclusively determine which of the two it is. Hubble’s image does not only tell us about a galaxy in our own cosmic neighbourhood, however. We can also discern glimpses of objects much further away, whose light tells us about earlier eras in cosmic history. Right across Hubble’s field of view, more distant galaxies are peering through NGC 1073, with several reddish examples appearing clearly in the top left part of the frame.